Happy-Go-Lucky (2008): When it comes to film and storytelling, it's much easier to create darker characters. Everyone can relate to pain, suffering, loneliness, etc. Think about the Oscar-nominated performances from years past. How many of these portrayals were about broken, hurting, or even downright evil people? Think of Heath Ledger's winning performance as the Joker. Think of Daniel Day-Lewis last year in There Will Be Blood. Happy characters simply aren't relatable. We are either annoyed by them or feel a sense of falsehood, as if they're just faking their happiness. So when a genuinely cheerful character comes along that has such an incredible spirit, it grabs my attention. Poppy (Sally Hawkins) in Happy-Go-Lucky is a 30-year-old primary school teacher in London that lives life with gusto. Effervescent and cheerful, she manages to have an idealistic view of the world that somehow doesn't slip into naivety. She's continually presented with hardships--a stolen bicycle, an angry driver instructor, a student being abused at home, etc.--yet approaches every person and circumstance with a positive curiosity and a smile on her face. Everything about Poppy is simply good. She elicits a feeling of elevation, a sense that there is something admirable and worth living for in our world. To many others around her, she is an anomaly at best and an annoyance at worst. Her younger sister wonders when she'll grow up. Her driving instructor is clearly perturbed by her bubbly personality, calling her childish and continually berating her. Yet she isn't childish; she's childlike. Poppy has continued to embrace a deep fascination for the world around her, especially the people she encounters. Every person she interacts with is an opportunity to learn, to charm, to experience something new and beautiful. Her roommate has grown to understand and love the zestful energy that comes from Poppy and her huge smile. Director Mike Leigh creates scripts that are witty, genuine, and often improvised. This creates an incredible sense of sincerity; the audience understands that Poppy is exactly who she says she is. With strong British accents and fast-paced dialogue, it can take a moment to catch exactly what is being said and where the story is heading. In fact, there isn't much of a "story" to find. Instead, we get to dive deep into a character study of someone who has found genuine joy in life. By the end of the film, I felt like I was Poppy's friend, that if I met her that she would like me, that she would like my wife, that we would be instantly accepted by her as beautiful and valuable. I wonder if this is the kind of joy that Paul was speaking about in Philippians, calling us to rejoice always. Poppy has a lifestyle founded upon a joy that stems from being content with herself and with what life has to offer. Sally Hawkins deserved an Oscar for what I am calling the best female performance of last year. It takes an incredible person to create a character so complex, so intricate, and so filled with life. I wish I could meet Poppy. Happy-Go-Lucky is a fantastic and honest film, and one of the best movies from 2008. I've Loved You So Long (2008): How would your perspective change after spending 15 years in prison? What would it be like to re-enter a world that had all but forgotten about you? How would your family react? What would it be like to rebuild your life? 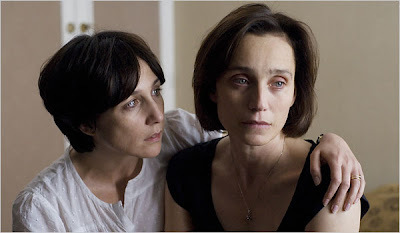 These are the questions that faces Juliette (Kristin Scott Thomas) in the French film I've Loved You So Long. After being released from prison, she lives with her younger sister and her family, struggling to adjust to having a family once again and process her inner feelings of guilt and pain. Meditative and quiet, the film reveals the depth behind the ordinary things we take for granted, such as a dinner with friends or a casual date. Juliette hasn't had these for 15 years, yet is expected to navigate these social settings without breaking down. The relationship between the two sisters in I've Loved You So Long reminded me a great deal of another tragic family film from '08, Rachel Getting Married. There is a deep love between the sisters that goes beyond words, a love that transcends the past, no matter how tragic. The younger sister, Lea (portrayed marvelously by Elsa Zylberstein), must find a way to be patient and available for her older sister who disappeared from her life when she was only a child. Kristin Scott Thomas also gives a notable performance, managing to communicate a great deal about her inner struggles without words. A longing look or a sudden welling of tears reveals the turmoil inside as she deals with the guilt of her crime while wanting to move forward with her life. I really appreciate the title of the film, which sounds almost grammatically incorrect. Shouldn't it be "I've Loved You For So Long?" Yet the removal of one word creates a delicately complex phrase with multiple meanings. The title stems from a childhood duet the sisters learned on the piano, playing together for Lea's daughter at a pivotal moment in the film. This film isn't happy by any means--if you want happiness, read the review above for Happy-Go-Lucky--but it is intensely real. The power is in the performances from every actor, who convey deep emotions in way that the audience can sympathize. Thomas deserved more recognition for her performance in this Golden-Globe nominated film. Nick and Norah's Infinite Playlist (2008): I was chatting with my film-maker friend Gabe a while back about our mutual love for movies. He mentioned that director Peter Sollett has spoken in one of his film classes about his film Nick and Norah's Infinite Playlist. 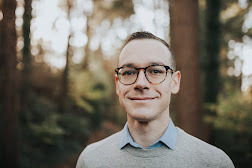 Gabe talked about how Sollett had mentioned the production of the film, that some scenes were placed in the movie to satisfy producers rather than add to the overall flow of the story. Now having seen the film, I think I know what he meant. Hipster teenagers Nick and Norah (Michael Cera and Kat Jennings) end up on a one-night adventure through New York city looking for a favorite local band. Well, they don't start off together. Norah asks Nick to be her boyfriend for five minutes to impress her stuck-up companion Tris, only to find out that Tris recently broke up with Nick. Talk about awkward. But that's what this film thrives on--endearing awkward moments. Nick's heart has been crushed by the shallow Tris, and he tries to work through those feelings through cumbersome voicemail messages and creating mix-tape CDs. Turns out that Norah loves the CDs and Nick's taste in music, which translates to a really great soundtrack for the evening. 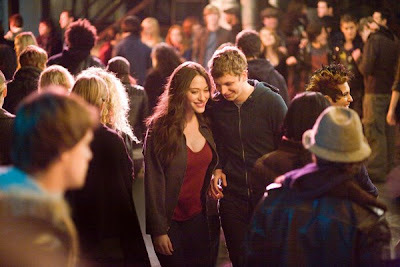 The film is filled with these authentic and down-to-earth moments, usually between Nick and Norah. Yet scattered throughout are scenes that feel quite forced. Nick plays bass guitar for a band he's formed with two gay friends. These guys are present for cliche gay jokes and to provide transportation for the evening. Norah has her own friend, Caroline, who plays the over-the-top drunk teenager role. The side characters and a few scenes feel a bit like filler to the story of Nick and Norah, sometimes to the detriment of the overall flow of the story. When the film falls into the cliche teenage movie, it loses steam; when it sticks with its unconventional authenticity, it's delightful. Overall, it's a quirky teenage romp through New York with a great soundtrack and a few memorable spots. 1984 (1984): In a word: BOOOORRING. George Orwell's dystopian classic novel is one of my favorites. 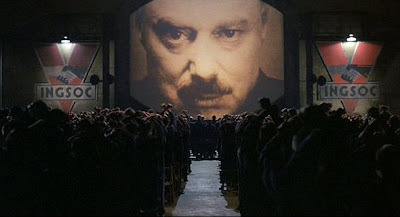 Dark, bleak, and a commentary on the human condition, 1984 was Orwell's take on the state of humanity under a Communist-like regime that controlled the populace through re-writing history, destroying all emotions, and watching everyone through monitors called telescreens. The novel follows Winston Smith, a worker for the party that rewrites history in the newspapers. He longs for redemption from the oppressive rule of the Party, wishing that he could share this with someone. Two people stand out to him that could possibly share his desire for freedom--Julia, a rebellious young woman; and O'Brien, a high-level worker for the party who seems to have some secret. Director Michael Radford's take on Orwell's novel captures the heart of darkness in the novel, but is quite poorly edited and confusing. With very little dialogue, extremely slow pacing, and focusing mostly on the bleak visuals, much of the novel goes untapped and unexplained. If I had not read the novel, I would have had no idea what was going on. There are awkwardly long scenes of Julia and Winston completely naked--not really in a sexual way, just hanging out naked together. Yes, this is done in the novel, but it comes across as tasteless in the film. There are also awkwardly long scenes of O'Brien interrogating Winston in the Ministry of Love. There are some bright spots. Richard Burton portrays O'Brien with a tired cynicism, a subtle performance that sadly ended up being his last. He makes for a great antagonist. Roger Deakin's cinematography is also noteworthy. But simply put, Orwell's terrifying novel is turned into a bleak and boring mess of a film. Go read the book instead.